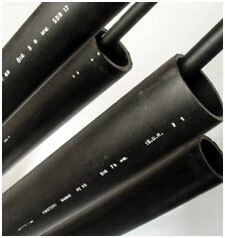 T-flex pipe systems are used for a large variety of applications. It is being extensively used for new as well as replacement piping works throughout the world. Dadex PE pipes have a smooth internal surface, and have characteristics such as corrosion resistance, availability in long lengths, ease of installation and leak free joints. HDPE T-flex pipes are manufactured in nominal outside diameter of size 20, 25, 32, 40, 50, 63, 75, 90, 110, 125, 160, 180, 200, 250, 280, 315, 355, 400, 450, 500, 560 and 630mm. Coils up to 50m and 100m lengths are available for sizes up to 90mm. Pipes are available in straight lengths of 6m and 12m sizes up to 630mm.